Archaeologists dug up a lot of cool stuff in 2018, but they dug up a lot of weird, disgusting, and disturbing stuff as well. Here are the strangest archaeology stories the year had to offer. No doubt, 2018 was a banner year for archaeology. It was a year that witnessed the discovery of a 50,000-year-old human jawbone in Israel, the oldest known drawing, and 2.4-million-year-old stone tools in Algeria, among the many other extraordinary findings that redefined our conceptions of human evolution and history. But profound and illuminating is not what we’re here for today. Instead, we’re going to talk about archaeology’s wilder side. From the bizarre and mysterious through to the shocking and profane, here are the 15 strangest archaeological discoveries of 2018. 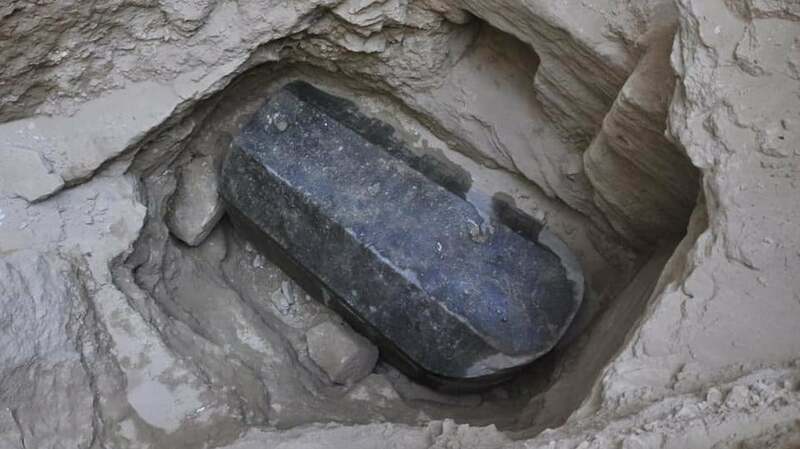 In July, archaeologists from Egypt’s Ministry of Antiquities announced the discovery of a large sealed coffin in Alexandria. 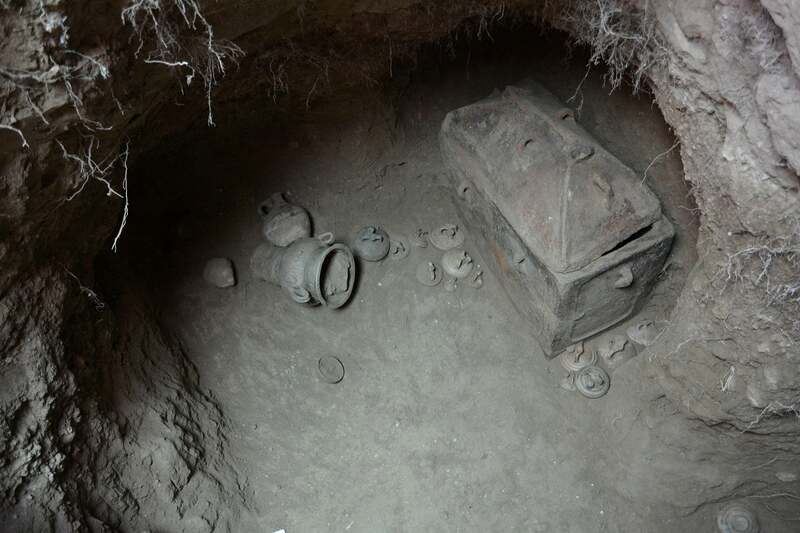 The contents of the 2,000-year-old sarcophagus were unknown, prompting fears its opening might unleash an ancient curse. Undaunted, archaeologists opened the coffin on 19 July. Instead of revealing the body of Alexander the Great, as some had hoped, the coffin contained three skeletons, a female and two males, soaking in an unsightly reddish-brown liquid. One of the males had a small hole in the back of his skull, a possible sign of brain surgery. The coffin was dated to the early Ptolemaic period between 304 and 30 BC, but strangely, the bodies weren’t placed in the coffin at the same time. As for the strange reddish liquid in the coffin, that came from sewage water that mixed in with the skeleton’s wrappings. In all, a thoroughly disgusting and underwhelming discovery that posed more questions than it answered. Archaeologists in Egypt uncovered the rocky remnants of 3,200-year-old cheese in the tomb of of Ptahmes, a political dignitary from the 19th Dynasty. 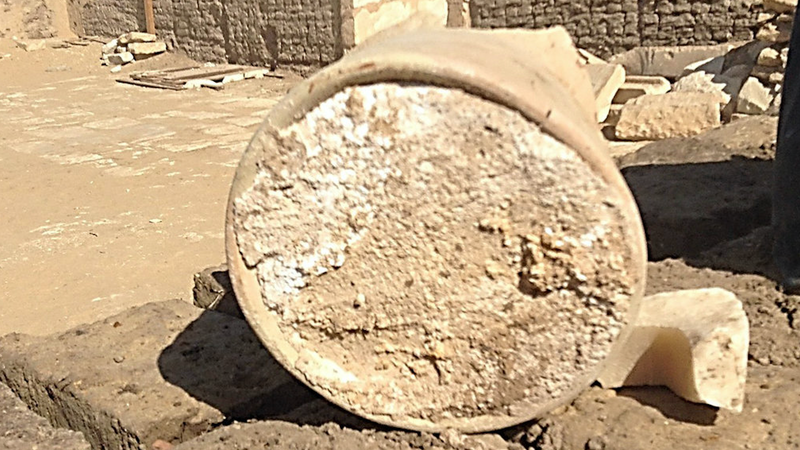 It’s considered the “most ancient archaeological solid residue of cheese” ever found. Chemical analysis suggested the cheese was produced by mixing milk from goat, sheep, and African buffalo. But the cheese also contained traces of Brucella melitensis, a bacterium that causes brucellosi—a nasty, but typically non-fatal, health condition. The cheese likely had a consistency similar to chevre, but with a tremendously acidic bite. When mount Vesuvius erupted in 79 AD, the unfortunate citizens of Pompeii were assaulted by an assortment of threats, from falling debris and collapsing structures to fast-moving avalanches of rock and ash. New research published this October uncovered another method of death: exploding skulls caused by the volcano’s intense heat. Known as “thermally induced fulminant shock,” this unsettling form of death was triggered by superheated clouds of gas that made brains boil inside of skulls, causing them to crack and explode. Mercifully, the victims likely did not suffer, dying instantly as their brains turned to ash. Staying with Pompeii, archaeological work done at the site in May revealed a male skeleton that appeared to have its head crushed by a giant stone. The skeleton was found on the first floor of a building just slightly above a layer of volcanic debris, suggesting the individual was seeking shelter as the eruption progressed. 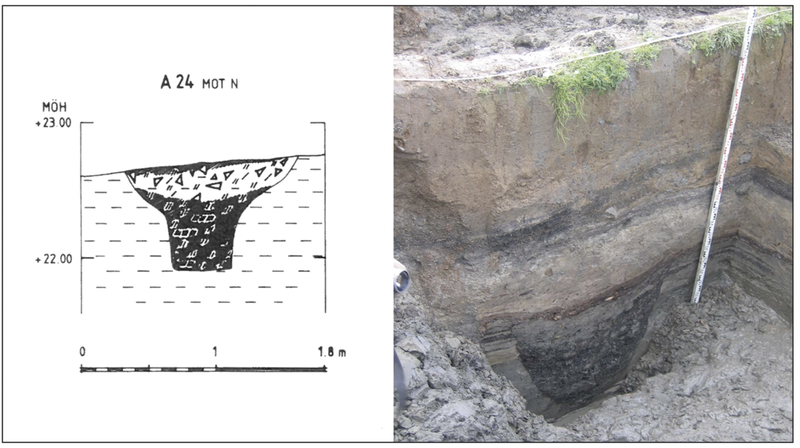 But in June, the skeleton’s fully intact skull was uncovered nearby, having been relocated by the processes of erosion. 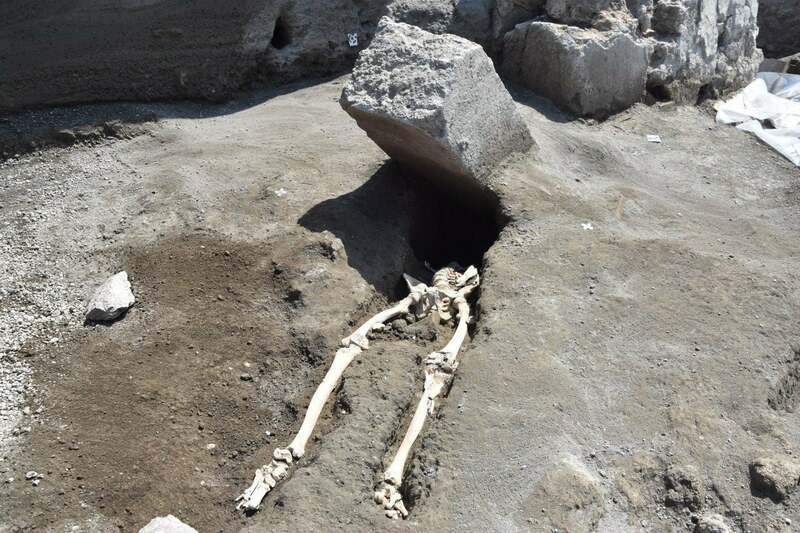 The man likely suffocated during the eruption, and the boulder fell onto his body after he died, according to researchers at Pompeii Archaeological Park. In April, Italian anthropologists described the remarkable discovery of a medieval Italian man who replaced his amputated hand with a knife. The skeleton was found in northern Italy back in 1996, but a careful re-analysis of the remains suggested the man replaced his missing appendage with the knife, which he attached to the stump with a cap, buckle, and leather straps. Dental wear showed he likely tied it on with his teeth. The researchers say he managed to live a long time with the knife-for-a-hand, and he may have brandished his prosthetic blade as a weapon. Dude was a badass, no question. 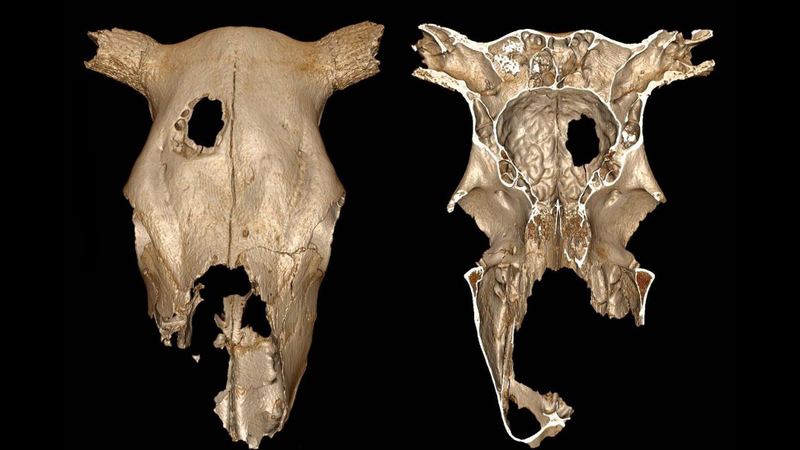 The holes in a 5,000-year-old cow skull found at a Neolithic site in France were not the result of an animal-on-animal altercation, but the deliberate cut marks made by ancient proto-brain surgeons, according to a paper published this April. The humans who performed the surgery may have been trying to save the life of the cow, but the more plausible explanation is that they were refining their surgical techniques by practising on cows. 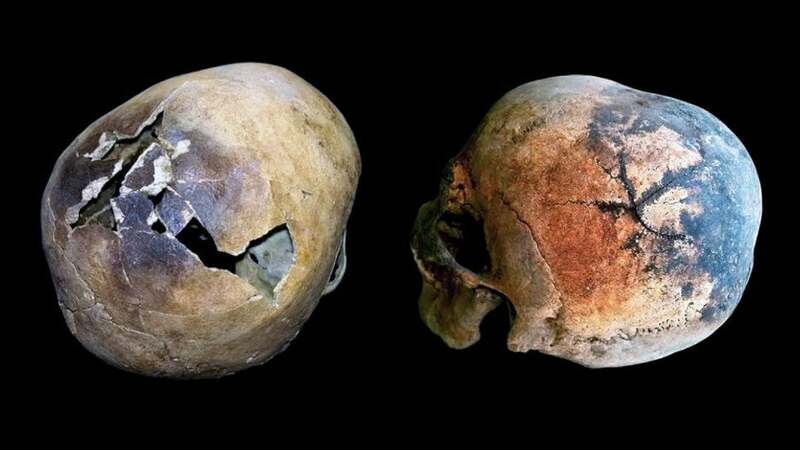 Early humans engaged in trepanation to treat physical symptoms and for ritualistic purposes, and they were pretty good at it. But like humans today, they preferred to practice on nonhuman subjects before cutting into the skulls of friends and family. The discovery represents either the first evidence of surgical experimentation on an animal, or the very first record of a veterinary act. Either way, it’s still very cool. 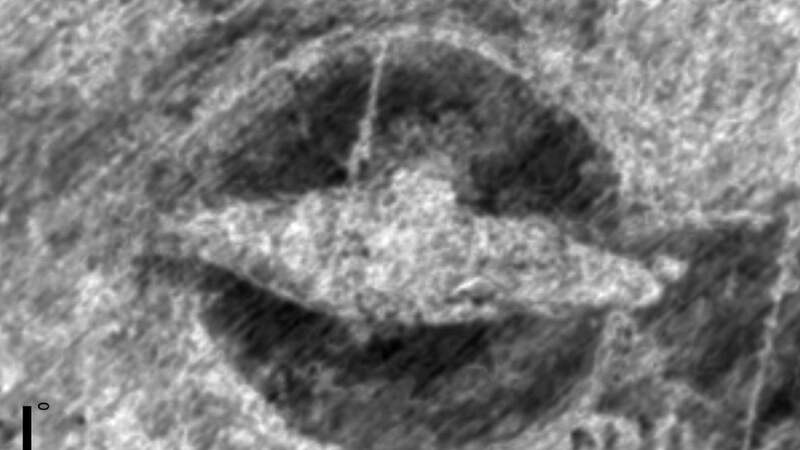 Archaeologists with the Norwegian Institute for Cultural Heritage Research (NIKU) used ground-penetrating radar to detect an ancient Viking ship buried just 20 inches beneath a farmer’s field, and within eyesight of the busy Norwegian RV41 188 motorway. The 66-foot-long ship, dating back to around 800 AD, appears to be in remarkably good condition. The ship was deliberately buried as part of a Viking funeral ceremony, and it’s wholly possible the vessel contains human remains. No word yet on if or when archaeologists will excavate the site. On the topic of Vikings, archaeologists also discovered a previously unknown method of tar production. The protective goo was applied to the planks, rigging, and sails of ships, giving Viking vessels added durability and reliability. During this era, tar was produced by collecting the drippings from slowly burning wood. It’s estimated that a single Viking tar pit was capable of producing 50 to 80 gallons of tar during each production cycle. By the 8th century AD, Vikings had the capacity to produce the sticky substance at industrial-scale levels. Without all this tar, and without their formidable ships, the Viking Age would likely never have happened. 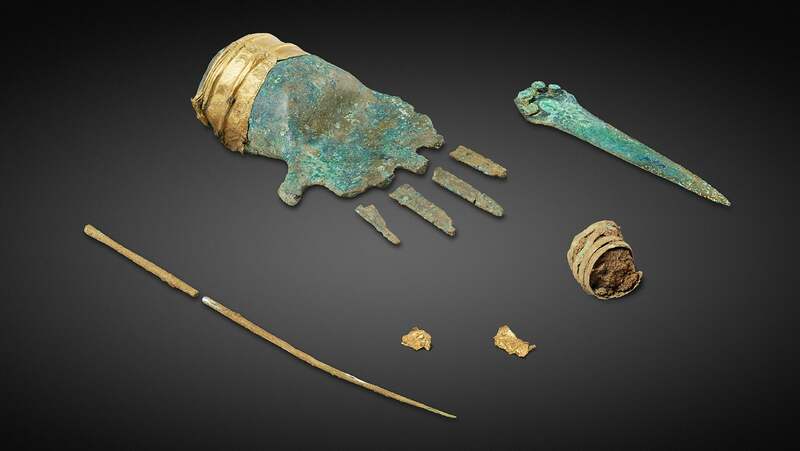 In September, a mysterious bronze hand and its thin gold cuff, along with a bronze dagger and a human rib bone, were discovered near Lake Biel in Switzerland. The hand of Prêles, as it’s called, is slightly smaller than an adult hand and was cast from about a pound of bronze, though its purpose is unknown. The bronze hand dates back, appropriately enough, to the European Bronze Age, about 1,500 to 1,400 BC. It’s doubtful the hand was worn, as a socket inside the relic suggests it was mounted on a staff of some kind. Regardless of its purpose, the hand of Prêles is now the oldest bronze artefact depicting a part of the human body. 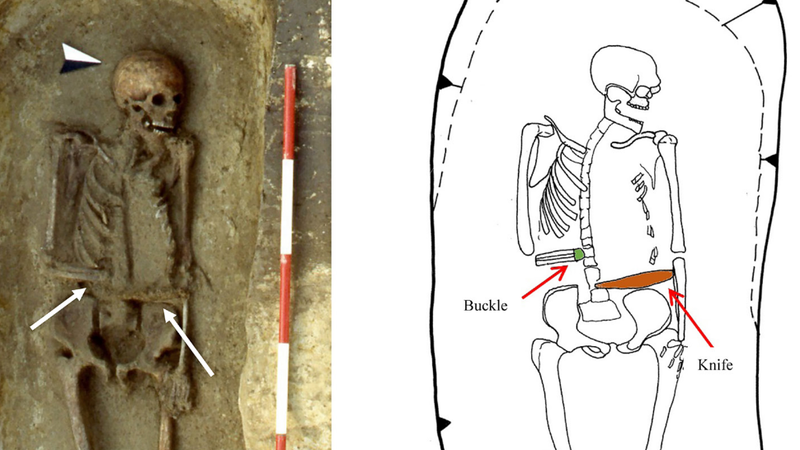 In one of the grimmer discoveries of the year, scientists analysed a 7th or 8th century medieval grave in Imola, Italy, containing the remains of a woman and a fetus lying between her legs. But don’t despair, the pregnant woman was not buried alive. Rather, it’s an example of “coffin birth,” or “post-mortem fetal extrusion,” a rare phenomenon that happens during the decomposition phase. Around two to five days after death, gas builds up inside the body, forcing the fetus of a pregnant woman to be ejected through the vaginal canal. Researchers say the fetus had already died by the time the woman was buried. 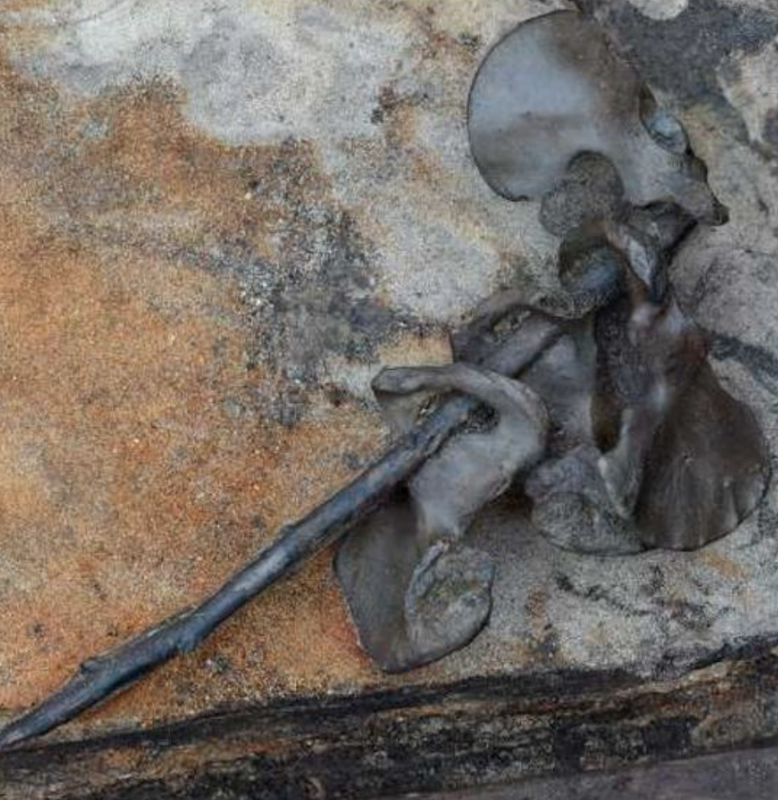 While sifting through a gruesome 2,000-year-old battlefield in Denmark, archaeologists from Aarhus University uncovered 2,095 bones, representing at least 82 individuals. As many as 380 warriors—including a handful of women—were involved in the surprisingly large Iron Age battle. The conflagration likely pitted Germanic tribes against each other, and no evidence exists to show that Romans, who were marauding the area at the time, were involved. Evidence uncovered at the site suggests somebody, possibly the conquerors, dismembered the fallen warriors, crushed their skulls, and arranged their bones onto tidy piles. In one extreme case, pelvic bones were strung together on a tree branch. As a final insult, the bones were placed in a nearby lake and held down with stones. This bizarre “bone ritual,” which happened in a Germanic region of northern Europe during the Roman Period, was likely done to flaunt the victory and demean the vanquished, but the exact purpose of this “organised and ritual clearing of a battlefield” is unknown. While trying to park his vehicle under the shade of an olive tree, a Crete farmer began to notice that the ground beneath him was starting to sink. After pulling away, he noticed a hole about four feet wide. Gazing into the void, he immediately realised he had stumbled upon something important. Friendly neighbourhood archaeologists were brought in to inspect the site, which turned out to be a 3,400-year-old tomb dating back to the Late Minoan era. The site contained two coffins, each holding a single male skeleton. The archaeologists also uncovered two dozen pots with coloured ornaments. 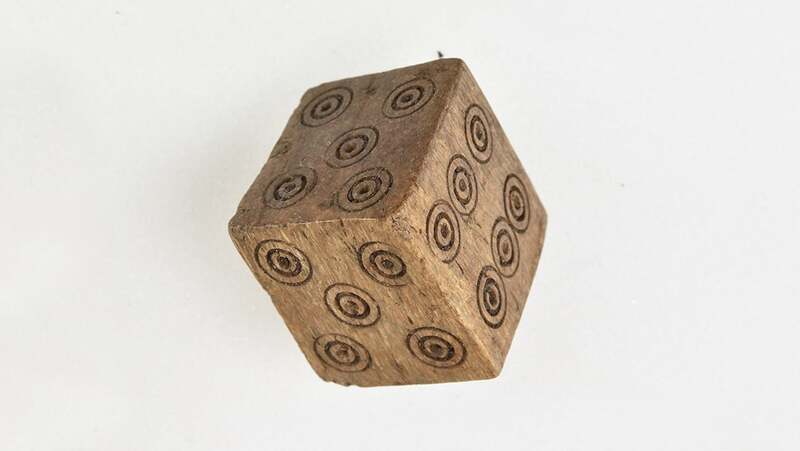 Archaeologists from the Norwegian Institute for Cultural Heritage Research (NIKU) found a rather suspicious six-sided die in Bergen, Norway earlier this year. Dating back to the 15th century, the cheater’s die is missing its one-side and two-side, instead featuring two fours and two fives. The die was likely used in Passe-dix, or Passage, an old and easy-to-learn gambling game. As to why the designer placed the two fives adjacent to each other, and not opposite, is anyone’s guess. No one said cheaters were smart. 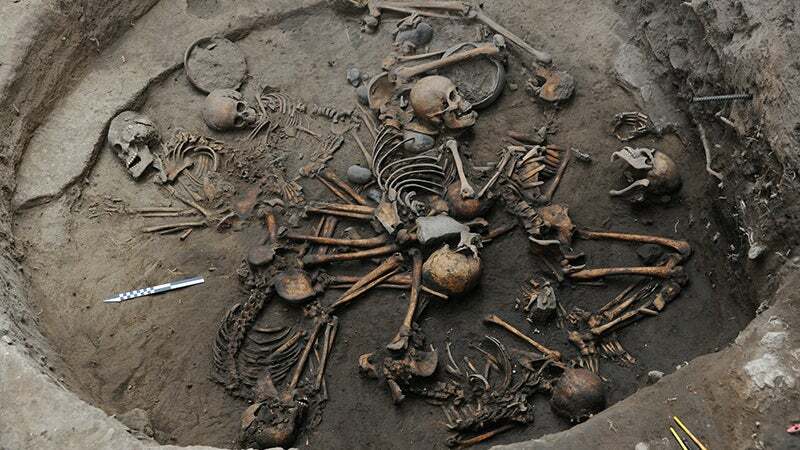 A 2,400-year-old burial site near Mexico city yielded a bizarre and previously unknown funeral ritual in which the bodies were placed in a circular formation. The skeletons, which included two females, a male, a child, an infant, and five yet-to-be identified bodies, were arranged in spiral formation around a concentric point, as if to suggest the bodies were spinning around a central axis. The bodies, dated to Mexico’s Pre-Classical Period, were placed on their sides, with arms and bones interlocked. Cause of death could not be established nor the purpose of this apparently elaborate ritual. 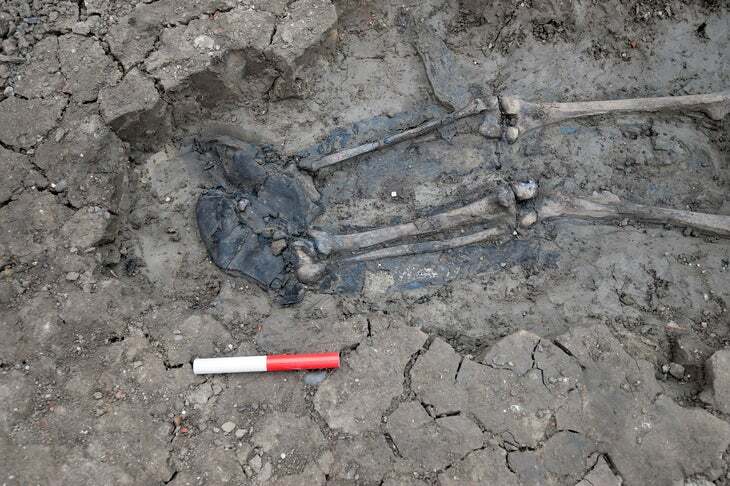 While preparing a site for future sewer work, Museum of London Archaeology scientists stumbled upon the skeletal remains of man buried in Thames River sludge. Remarkably, the skeleton is still wearing his thigh-high leather boots. 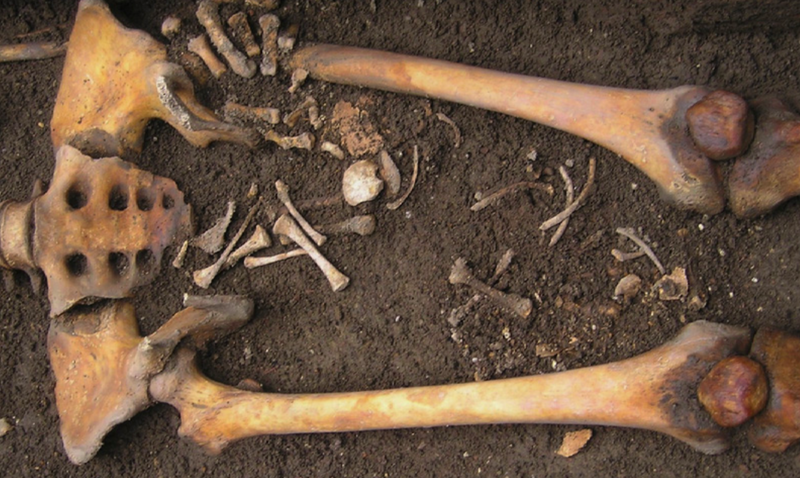 The man died about 500 years ago in London, but the cause of death isn’t known. Based on the orientation and location of the body, however, it’s likely he drowned. Moreover, his fancy leather boots, which resemble modern waders, are a good sign he made a living off the river, likely as a fisherman, sailor, or a mudlarker (a person who sifts through mud in search of lost valuables). And in yet another clue, his teeth had grooves cut into them, a sign he may have passed rope through his teeth, which fisherman are known to do.